1. For the hollandaise, melt the butter and transfer to a small jug. Put the egg yolks, lemon juice and salt in either the small bowl of a food processor or, if you’d prefer to use a handheld stick blender, a tall cup. Blend until emulsified. With the motor running (on either the processor or blender), very slowly pour in the melted butter to make a light, foamy hollandaise. As you add the butter, the milk solids will start to gather at the bottom of the jug; stop pouring when you reach them and discard the solids. Season the hollandaise with white or black pepper and, if very thick, thin with a little water; set aside (it will hold like this for at least 30 minutes). 2. Preheat the oven to 180˚C, gas mark 4. Arrange the tomatoes on a medium baking tray, drizzle with the oil and balsamic vinegar, season and scatter over the thyme. Lay the pancetta on a separate baking tray. Bake both for 10 minutes. Strip the leaves from the cavolo nero stalks and tear into 5cm pieces (save the stalks for smoothies or soups). Stir the torn leaves through the tomatoes, turning them in the juices. Turn over the pancetta rashers and return both trays to the oven for 5 minutes. 3. Meanwhile, heat a large saucepan over a medium-low heat and fi ll with boiling water. You want just a few small bubbles rising to the surface. Crack an egg into a tea cup. Stir the water gently to create a vortex; once it has started to slow down, tip in the egg. Cook for 3-4 minutes, until the white is set but the yolk is still soft, then lift out with a slotted spoon and pat dry on kitchen paper. Repeat with the remaining eggs. 4. 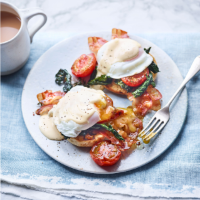 To assemble, top the toasted muffin halves (or halved slices of sourdough) with the pancetta, cavolo nero and tomatoes (discard the thyme but spoon over any roasting juices), plus the eggs. Spoon over the hollandaise, grind over a little black pepper and serve at once.